Introduced into Congress two days before the fall of France and signed into law three months later as Luftwaffe bombs set London afire, the Selective Training and Service Act began the process by which fifteen million Americans were inducted into the armed services during the Second World War. Clifford and Spencer recount a neglected but vitally important development in the transformation of American policies prior to Pearl Harbor--the first time in American history when men were conscripted into military service during peacetime. 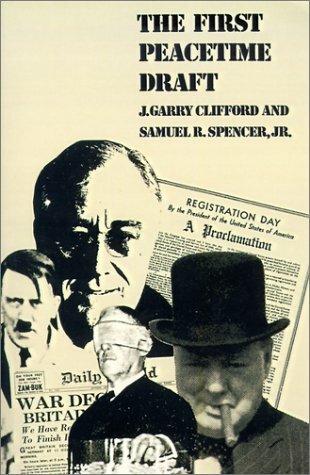 Central to the discussion in The First Peacetime Draft is the first important American policy response to Hitler's victory in Europe in the spring of 1940--the Selective Service Act. It marked the effective end of the isolationist tradition in the United States because for the first time while the country remained officially at peace civilians were drafted into the armed forces to face the possible threat of aggression from abroad. Emerging from the initiative of civilians, not from the Army or the White House, the conscription campaign resulted in a colorful three-month public debate that engaged the entire population. This volume is based on research in more than ninety manuscript collection in the United States, Canada, and Britain, as well as interviews with some two dozen participants. In addition to being a detailed political history of the debate over conscription, it places the draft in the context of Roosevelt's zig-zag path to war and evaluates it in terms of the overall evolution of the American defense and foreign policies since 1940.